Given continuing budget pressures combined with the focus on performance envisioned in the GPRA Modernization Act of 2010, federal agencies need to identify ways to operate more efficiently. GAO was asked to (1) describe selected initiatives that federal departments are implementing to achieve efficiencies; and (2) identify key practices associated with implementing these initiatives, as well as selected state initiatives, that can be applied more broadly in the federal government. GAO reviewed agency documents and interviewed officials from the Departments of Homeland Security (DHS), Veterans Affairs (VA), Defense (DOD), and Housing and Urban Development (HUD), as well as officials from five states--Virginia, Iowa, Texas, Washington, and Georgia. Federal departments in our review used different approaches to improve efficiency. Their efficiency initiatives generally fell within two categories--(1) reexamining programs, structures, and functions to determine whether they effectively and efficiently achieved their mission; and (2) streamlining and consolidating operations to make them more cost effective. For example, the Secretary of Defense's Efficiency Initiative, HUD's Transformation Initiative (including HUDStat), and VA's Operational Management Reviews implemented broad examinations of their programs, structures, and related processes. DHS's Efficiency Review, VA's Project Management Accountability System, and DOD's Continuous Process Improvement/Lean Six Sigma Program employed targeted methods to streamline and consolidate processes and systems. Most of the federal initiatives were relatively new; consequently, their overall impact has yet to be determined. However, each of these initiatives, as well as select state initiatives--such as the Virginia Productivity Investment Fund--demonstrated key practices from which federal agencies could learn. 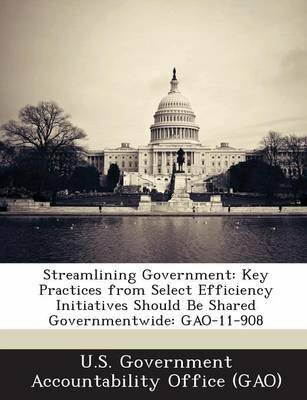 GAO recommends that OMB share the key practices for implementing efficiency initiatives identified in this report, and develop proposals for funding mechanisms to support upfront investment costs of longer-term efficiency projects that could result in greater cost savings or other efficiencies in the future. OMB staff stated that the report does not give sufficient weight to its sharing of information consistent with the key practices GAO has identified. While the report recognizes a number of OMB's initiatives, GAO is unaware of the extent of OMB's efforts to share the practices identified in this report. DHS, DOD, VA and HUD had no comments on the recommendations.